This self adhesive copper foil attaches immediately and firmly to the edges and corners of the glass, regardless of its shape. Exceptional resistance to temperature and weathering. 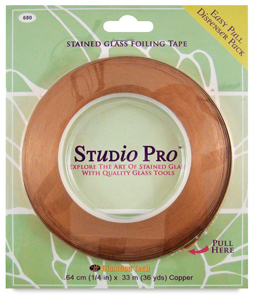 For all stained glass projects. ™ Studio Pro is a trademark.® Diamond Tech is a registered trademark.